I could have entitled this article, “Do Christian women today need to wear head coverings?” For that in good measure is what this particular passage addresses. But a simple yes or no answer is not so readily forthcoming, as I will seek to explain and elaborate upon in this article. So bear with me as I go through ten points about all this. After I present the first nine, I will then try to summarise things and offer a tentative answer to that initial question in my tenth and final point. One. By all accounts, 1 Corinthians 11:2-16 is a hugely difficult section of Scripture. In my series on difficult Bible passages, sometimes the passages are not so much difficult or hard to understand as simply radically abused and misused. But here we have a real doozy, a genuine theological puzzler on just so many levels. It is among the most difficult passages in the entire New Testament. It is quite simply an exegetical, hermeneutical, theological and pastoral minefield. Only those who have little or no genuine biblical and theological understanding think that it is a walk in the park. For example, there are a number of key terms which we really are not fully certain of, and there are some phrases which are still quite up in the air. For example, what exactly does “because of the angels” in verse 10 mean and refer to? Plenty of options have been offered here over the centuries, and it is still being hotly discussed! And what exactly does Paul mean by appealing to nature in verses 14-15? Along with these larger contextual questions, this passage is full of notorious exegetical difficulties, including (1) the “logic” of the argument as a whole, which in turn is related to (2) our uncertainty about the meaning of some absolutely crucial terms and (3) our uncertainty about prevailing customs, both in the culture(s) in general and in the church(es) in particular (including the whole complex question of early Christian worship). Paul’s response assumes understanding between them and him at several key points, and these matters are therefore not addressed. Thus the two crucial contextual questions, what was going on and why, are especially difficult to reconstruct. Good critical commentaries will offer the many options and possibilities of the various debates involved; will weigh up all the pros and cons of the contentious words, phrases, ideas and concepts; and will perhaps offer their own opinions on how they understand things. Bad commentaries will ignore all this and insist that they alone have all the truth and insight on these contentious matters. Two. Simply discussing just one of the numerous difficult terms here shows how complex things are. The English word “head” comes from the Greek word kephale. But as any first-year Greek student knows, the question is, how is kephale best translated and understood? Does it mean a literal or a figurative head – or both? If metaphorical, we can translate it in many ways, such as authority, leader, chief, top, preeminent, foremost, source, origin, etc. As with all things biblical, a small library already exists on just this one word, and how it is not only used in this chapter, but also in the rest of the New Testament, in the Greek Old Testament (the Septuagint), in the Hebrew text, and in non-biblical sources. Let me offer just two examples of how complex things can get here. One evangelical scholar has gone through 2,336 uses of the word in extra-biblical documents from the writings of thirty-six Greek authors, trying to get a handle on how it should/could be used. And Anthony Thiselton in his massive 1450-page commentary on 1 Corinthians spends 50 pages on this portion of Scripture, with an entire ten pages devoted to just this one Greek word and its multiple meanings. This is indeed not a lightweight matter. Then we have a number of questions as to who exactly Paul has in view here when he discusses headship and the like. Is he referring to all men and women in general in these remarks, or is he specifically referring to husbands and their wives? Debate is still ongoing concerning these sorts of issues as well. Three. This is part of the larger and exceedingly contentious issue of the role of women in the church (and to an extent, their role in the home as well). That broader subject is of course another hot potato area of controversy with many wars breaking out continuously on how we should understand all this. Briefly, should we opt for an egalitarian, feminist understanding here, or a hierarchical, complementarian position? Once again entire libraries exist with books and articles on this – and I have many of them. It is a massive debate and certainly one that will not be resolved here. So this particular pericope is simply part of a much bigger biblical debate, and to do the former real justice, we need some understanding of the latter as well. But here I simply cannot enter into that larger debate, alas. Perhaps another time. Four. There are many cultural and social issues discussed by Paul here which appear to be to some extent at least lost on us. Cultural considerations are certainly important, but by now it should be obvious that we are not fully clear on all the cultural and social practices taking place some 2000 years ago. And even if we were, the question remains as to how they translate into quite different cultures today. Was the lack of head covering an indication of sexual immorality? For example, did prostitutes back then dress (or undress) this way? Are some homosexual practices in view here as well? And it is not even certain if Paul is referring to actual head coverings here or some sort of veil, or just to particular hairstyles. Even that debate is by no means resolved 2000 years on. And this same passage speaks about what a shame it is for men to have long hair. What exactly does that mean? How long is long? Back when I and many others in the hippy counter culture got saved in the late 60s and early 70s, that one phrase caused no small amount of concern for many of us! Also, we do know that many cultural practices from back then are no longer relevant or fully applicable today. For example, washing the feet of others when folks walked on dusty roads in sandals made perfect sense back then, but not now. Today we might wash someone’s car or find some other contemporary cultural equivalency. And we are clearly commanded in the New Testament to ‘greet one another with a holy kiss’. Hmm, I do not find all that many Australian or American believers doing that today – are they living in sin therefore? No, that was a cultural practice back then, just as it still is in other cultures today. But a good hearty handshake would be one acceptable equivalent for us to employ today. Five. One crucial aspect about all this controversy and confusion is that this discussion that Paul has about proper clothing and coverings and the like was only about apparel in public worship – not elsewhere. Thus Paul did not have in mind how women – or men – should be dressing in other places. Thus we are not being commanded by Paul to have women covered up – whatever exactly that means and entails – as they go to Kmart, as they walk the dog, as they do dishes at home, and so on. This concerns only the issue of public worship – nothing else. Sure, modesty and purity is the broader issue here, and that applies to all believers in all places and at all times. Six. Properly understood, this is a secondary issue. It is not a primary issue which if you get wrong, you forfeit your right to be called a Christian. This is not a salvation issue in other words. There are of course some key biblical doctrines which we must adhere to if we want to be called Christians. If we deny core teachings such as the Trinity and the deity of Christ, then we forfeit the right to claim to be Christ followers. So yes, adherence to or rejection of certain key beliefs will put one’s salvation at risk. But this is not one of them. So with all such secondary matters, we have a bit of room to move here, and we dare not hurl anathemas at each other if we have differing understandings of how to comprehend and apply 1 Cor. 11:2-16. Seven. Because of all that has been said thus far, humility is certainly needed here. Given how very difficult this passage is, even to our greatest theologians, exegetes and interpreters, we all need to show a bit of grace and humility to one another. No one has the complete and perfect take on this tough passage. Even one of our greatest living New Testament scholars, N. T. Wright, has said this about the text: “Now I have to admit that I didn’t understand this passage then, and I’m not sure I’ve understood it yet.” Those who think they know exactly what this passage means, including all its component parts, are either kidding themselves or awash in pride and arrogance. Eight. What then, if anything, can we know with some certainty? I do not want to leave my readers in complete despair here. I am not claiming we know nothing about this tough text. I think that there are some broad general principles at least that we can adduce from this section of Scripture. Let me offer some of them. Despite its obscurities, Paul’s teaching in this passage clearly affirms three things: a balance between (1) respect for a creation mandate to maintain and even celebrate the gender distinctions with which we have been created; (2) a respect for culturally specific approaches to guarding moral and sexual purity; and (3) a commitment to fully integrating women and their gifts into the experience of the worshiping community. The distinction between the sexes is to be maintained; the covering is to go back on; but for Paul it does not seem to be a life-and-death matter. Nine. Some try to weasel their way out of all this and claim things are really simple by appealing to verse 16: “If anyone wants to be contentious about this, we have no other practice—nor do the churches of God.” They think Paul has just undone everything he has been saying in the previous 14 verses, and is saying ‘let’s not get into a fight over this’. Ten. OK, I am now finally at a place where I can offer a very tentative – and probably to some, an unsatisfactory – reply to our original question. And my response is this: if Christian women prefer to wear head coverings, that is up to them. I do not believe it is mandatory, and I do not believe we should condemn those who don’t, or those who do. And as noted, if they do, Paul seems to indicate this is only for public worship, not elsewhere. One main thrust of this passage is modesty and moral purity. That is the bigger, more important principle being pushed here. And as the entire Bible makes clear, this is as much an internal matter as anything merely external. Yes what we wear can be important, but biblical purity and holiness is at bottom a matter of the heart. So this is a matter of choice for believers, and it should not be turned into yet another legalism, and another case of unnecessarily condemning others. We have freedom in Christ and we have some room to move here, especially given how many very real questions remain about this passage of Scripture. And I realise that those Christians who think we can have perfect understanding of all things in this life will be quite unhappy with an article like this. They want absolute certainty and crystal clear answers NOW. They are impatient with any ambiguity, mystery or hard questions. Well, those sorts of believers I will never satisfy, so I will not even try. But for the rest of you, this has been my take on this. Indeed, since some Christians have already asked for my thoughts on this matter, that in part is why I have finally bit the bullet and weighed into this massively complex and nuanced debate. If it is helpful to some, fine. If it simply raises more questions, or gets some folks more upset, well, what can I say? God bless you anyway! Hi Bill, there has probably been as much debate on 1Cor. 11:2-16 as there has been for 1Tim. 2:11-15. Both centered around woman. We do know that the Church at Corinth caused Paul a lot of grief through their rebelliousness. We also know that Paul used a lot of woman in his ministry because culturally they were normally regarded as 2nd or 3rd class citizens who could move around and minister ” under the radar ” for want of a better analogy. Bill you are to be commended for the shear physical effort of drawing on the expertise of so many world renowned commentators in compiling this article. At the end of the day I suspect that there were cultural issues that influenced Paul writing as he did. As more and more archeological evidence is uncovered and examined, maybe we will get a clearer picture in years to come. Once again Bill, a humungous piece of work that is to be congratulated, regards, Kel. Hi Bill, thanks for all thd hard work preparing this article. I’ve attended churches with opposite views on this passage and wax witness to a lot of high emotion when it was discussed. My take is pretty simple. Like you, I think it is opaque due to Paul’s taking for granted that the church would understand the cultural context. This leads me to a simple conclusion. Seeing we are talking about God’s Word preserved for us, I think it is reasonable to assume that it is not an issue that is of great importance to later generstions as if it were surely God would have inspired Paul to be clearer in his writing. This is not to underplay the value of extended study, but simply to ensure we don’t fall out over it. Hi Bill, thank you for this article, it has indeed been both timely and helpful. The way you have explained and framed the issue has cleared my thinking on it and indicated some options for further study if required. A good analysis but I think what you have come up with, Bill, is what most good Christians know intuitively. I think you should have included the first verse in your analysis as part of the context because here we see Paul telling the Corinthians to imitate him as he imitates Jesus. In every other scripture we are told to directly imitate Jesus and take Him as our direct example so what we are clearly seeing in this passage is Paul bending the rules a little, which he admits to in 1 Cor 9:21 and indeed the first part of 1 Cor 11 definitely needs to be considered in the light of much of 1 Cor 9. What Paul was doing was for the practical purpose of leading a very young church in the way they should go. I think any wise Pastor knows you can’t just expect people to completely change their behavior and customs overnight even if the initial changes in behavior are dramatic and so, Just as those who have studied Jesus don’t take the instruction to imitate Paul instead of Jesus as a type of commandment, I don’t think Paul’s instructions for how the Corinthians are to respectfully behave are a general command. They are more correctly viewed as an interim step on the way to full knowledge as to how we should behave and also, perhaps, as an example of how evangelism is achieved. As far as women’s supposed inferior position to men there is only one aspect where I can see this in the scriptures but none the less a significant issue and that is the matter of gullibility. This is not only reflected in Satan’s deception of Eve first in the Garden but is seen today in matters such as how many more women support immoral, illogical things like homosexual ‘marriage’ than do men. In the U.S. Supreme court, for instance, I think there were three women who all, unanimously voted for the redefinition but of the six men, four ruled against the change. We see this sort of thing also in churches where women are allowed to take autonomous authority in the church, these are the churches that are vastly more likely to promote sexual apostasy. So submitting to others is in no way an admission of inferiority, it is the reverse. Jesus served the Apostles and even washed their feet. This is not, however, something that those with worldly perspectives can easily understand. There is definitely a natural tendency for women to take from men because this is a natural requirement for raising children but when this is coupled with a stubborn attitude as is promoted by modern feminism which states that women should not submit to men at all because that would mean an admission of inferiority, then that is when you get problems. I have seen this idea and attitude often create problems in marriages when there is absolutely no need for it to. When I lived in England, I attended a charismatic brethren church. At one stage we looked at this topic and decided women should have a head covering in the meeting. The women were not opposed to it for which I was pleased as in the UK, dressing up for church was the norm. The ladies, in particular, came in their Sunday best and the men in general wore suits, shirt, and tie. I have to admit I liked the women wearing hats because they looked so good in them. It added to their beauty and poise as the women wore some gorgeous hats. It was a bit like a day at the spring racing carnival at Flemington so it wasn’t all bad. Having been a ‘missionary’ (aka voluntary Christian worker) in India in the 80s, I would agree that a large part of this discussion involves varying cultural practices within Christianity. For most of my life I’ve been faced with decisions relating to dress, behaviour and the like. Coming as I did from a non-Christian background, I was often rather bemused by all this. One of my first introductions to Christian behaviour and attitudes was when I stayed with a former missionary family over the school holidays. One Sunday afternoon I thought I’d better catch up with some knitting that had to be finished before school resumed. There was a shocked silence when the family realized what I was doing. Even within the various Christian denominations there was a great deal of variation. I attended a variety of private schools – Anglican, Uniting Church and Presbyterian – did my nursing training at a Salvation Army hospital, and have probably worshipped in all the protestant denominations at one time or another. In India I adapted to their customs within churches (covering the head with the end of a sari, divisiion of male and female congregants, etc) and generally trying to be sensitive to local culture. But I never saw such things as being at the heart of the gospel. They were merely cultural differences: things I needed to be sensitive to, but which I should not allow to become an integral part of my faith. No doubt in heaven we’ll be done with these things… I don’t really know. But surely when Christ becomes “all in all”, everything else will fade into insignificance. Hi Bill, I think it is often too easy for Christians to over-react to New Testament topics like these ones about women in the church and in worship. There are two reasons I think so. Firstly, the letters Paul wrote to the churches in Asia Minor were not written to us, even though there is a lot we can learn from them. Had he realised that his letters would become part of the Canon of Scripture he may have taken a little more care explaining things or making his theological points clearer. Even though he was inspired by the Holy Spirit I don’t believe God sat him down and specifically dictated letters that would have universal application throughout the ages. Secondly, I believe it is important to understand that the Jewish and Greek worldviews of the first century would have influenced Paul’s thinking and writings in some way. If we try to squeeze any of the principles of his worldview into the context of a twenty-first century worldview we can start having problems. For example, compare the Jewish cosmology of Paul’s time to that we understand today and you get my point. They don’t match. Behavior and dress codes in Paul’s time may not be applicable to us today. So why should we enforce them if they do not interfere with our relationship with God? The matter of women’s headgear is now a political issue in Western, multicultural societies, when it comes to Islamic customs: How does the rationale behind Paul’s teaching to the Corinthians on women in church and marriage contexts compare to that offered by 1st Century AD Greek moralist, Plutarch and the Quranic and other Islamic oral traditions on the status and dress code for women? I think in addressing the ‘hated Scripture’ of Ephesians 5:22 as Michael calls it, we need to simply just point out how marriage and family breakdown because of a failure to wives to submit to their husbands. I did this once to a feminist in her face, and she just had no reply – only becoming extremely upset and angry, and having no proper rebuttal, and only screaming out ‘God bless’ sarcastically. God cannot be mocked. Deep down inside, I think, everyone intuitively knows about God’s design for the family. Those who hate it, not just wives’ submission, but also children being obedient to parents, and submitting to them, will have a failed family life, or an unhappy one. Such is the way we need to deal with modern people who are full of rebellion – point out what is happening in society today in response of their hatred of God’s design for the family . If people want to be upset, then they can just be upset. Thanks Bill. I like the err on the side of caution approach – especially when the act is not that difficult. I had to cover my head every time I was outside in uniform – and that without having a choice of head covering. Now I am in the mining industry, I have to cover my head with a helmet even in areas where it is obvious a helmet is not needed. Its not a big deal. I asked my wife to consider covering her head during worship when we married. Her reply was she would feel uncomfortable doing that as the only person in the congregation so I did not press the issue. One further observation I will make however is that when it comes to contentious issues like head coverings, husband the head of the wife, length of hair, eating blood – I notice in Western Christianity more often than not the tendancy to err on the side of permissiveness. That does concern me. One of the big issues when I spent time as a volunteer in Thailand was why Thais were so resistant to the gospel. One of the conclusions a seminar came to is that Bhuddhist monks were veiwed as far more obedient to their Lord, than Christians were viewed as obedient to their Lord. This does cause controversy but I definitely agree with the conclusion Bill comes up with. I have a slightly different slant on this subject. I personally felt relieved to give up my hats when I went to the Mission field in the mid sixties. Hats had always ruined my hairstyle making it flat on top which didn’t suit my face. On returning to my home church a couple of years later, for reasons of childbirth, and having no hats to wear I went to church without one. That experience really made me feel for the unchurched people who we invited to our services. I felt completely undressed in the church scene without a hat and with no high heels, because my feet were too swollen with pregnancy for fancy shoes… I suddenly realised that our churches were not a welcoming place to the “outsider”! What’s more our church was very evangelical and held an Open Air service in the main shopping centre every sunday night, where we witnessed to our faith and invited people to come to church and join us. How intimidated they would feel coming in ‘off the street’ amongst our well dressed congregation! I recognised the irony of this and although I felt ok in my situation to look out of place because I knew how they all loved and supported us as missionaries, I learnt a good lesson of putting myself in others shoes! We can be so short sighted about things sometimes and make relatively unimportant things an obstructive issue for our more important mission of saving the Lost. I was glad that soon after that hats in church went out of fashion in most churches. Glad to see I’m not the only one who finds these passages difficult and just a tad confusing. It is not easy to pass this off as purely a cultural issue. Having said that it, in and of itself, I believe an obedient and holy Christian life would not be impacted by skipping these scriptures. Surely, a precursor of Biblical exegesis is context and also the relationship to the whole of scripture. These particular scriptures are raise questions very much more of a fringe aspect, and not just of public purity in relation to appropriateness in worship. But they do support the intent to be holy and pure presented in other plainer scriptures, as well as the submission represented in Jesus life as well as repeat the natural order God set in place for the sexes. Also, I find it hard to understand why some congregations can get so militant regarding it’s interpretation, while external to a congregational worship setting, many in the same congregations would be wearing bikinis to the beach. I know this is not “congregational worship attire”, but I do find it funny how the furore over bikinis and certain modern female attire has disappeared in many cases while this remains. Like many things within the modern church, it can be a double standard. When I think back to the approach Paul expounded when referring to eating “unclean” foods when dining with others, I find that the emphasis comes back to loving one’s neighbours over the “law”, and, in these cases, also the emphasis on doing that which you believe to be right under God to avoid sinning against Him. The heart motivation. Actually I am glad that these scriptures are present, because what I find most revealing is how the scriptures reveal where people stand on issues of a range of issues, such as submission and purity, and even spirituality in general. It can be a divining rod for off-centre theology and self-righteousness. Thanks guys. I will not enter into here the broader debate about women and leadership until I first lay out the bigger picture discussion, including pros and cons, scriptural and theological arguments, and so on. One comment above said, “these letters were not written to us”. But Paul’s letters are written to the Gentiles, and everyone who is not a Jew, is a Gentile. The Lord said of Paul, “this man is my chosen instrument to carry my name before the Gentiles”. Jesus told us that he or she who is faithful in little things will be faithful with much greater things. Once, when a visiting pastor led the service in our church, he took his dirty, crumpled hanky out of his pocket, plonked it on his wife’s head, and said it didn’t make any difference. I was only a small child at the time, but I knew he had done this to mock my mother. In another “bible-believing” church, after the service, I saw the minister shake hands and talk to everyone leaving the church, and then a visiting woman with a headscarf came up; he took her hand as if to shake hands, but refused to even look her in the face, while he pulled her out the door until she was behind him. Ministers are clearly embarrassed by their refusal to submit to the plain words of scripture; why else would they mock and deride these women? Theologians who argue that these are mere cultural things are too afraid to lovingly ask their wives to cover their heads when they pray/prophecy. 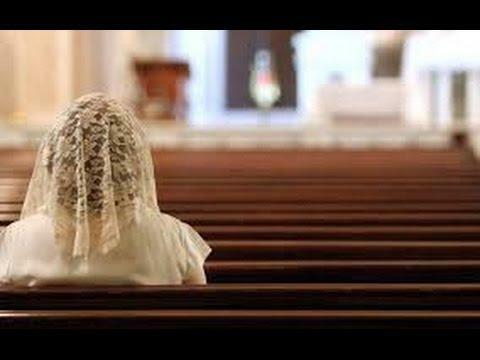 A married woman covering her head in church is affirming her one-flesh union with her husband. A married woman covers her head (her head) in church because she covers her head (her husband) during the marriage act. Those who don’t practise head covering often condemn those who do; but those who do, don’t condemn those who don’t. Scripture teaches us to bear with those who sometimes lack faith. God looks at the heart, as he showed by answering Hezekiah’s prayer not to condemn those who ate the passover even though there were “not clean according to the rules of the sanctuary”. As someone who had to cover his head every time he was outside and in uniform and now has to cover his head with a helmet whether he needs to or not if it is a designated helmet wearing area, I have often wondered what is so difficult about placing some simple form of covering over ones head when praying or attending sunday morning service. I have at times mused about doing the role reversal thing – covering my head during worship and see if anyone cracks up about that. But, I think we have much bigger fish to fry – the love of money, being one of the biggest logs we western christians have in our eyes at this time.